In this case, however, truth is at least as strange as fiction. Consider that the top recipient of US foreign aid over the past three decades isn’t some impoverished land filled with starving kids, but a wealthy nation with a per-head gross domestic product on par with the European Union average, and higher than that of Italy, Spain or South Korea. The powerful right-wing lobby doesn’t represent most American Jews, and it’s no longer the only game in town. Last summer, this magazine enthusiastically endorsed Bill de Blasio in his campaign for mayor of New York City, praising “his commitment to reimagining the city in boldly progressive, egalitarian terms.” Later we celebrated his landslide victory, and we still stand firmly behind him on the issues most critical to the future of New York. Deplorable? Yes. Surprising? Hardly. Perhaps the most depressing feature of this ritual of abjection is its predictability—the fact that for decades, this has been standard operating procedure for many American politicians, even ones who are steadfast on core progressive issues like de Blasio. Office-seekers learn to assume early in their career that if they don’t pledge fealty to AIPAC, retribution will be swift and their political life could be a short one. So rather than test the limits of the lobby’s power, most of them go along. AIPAC’s dominion—reinforced by Christian Zionists and the usual cast of neocon hawks—is destructive on many fronts. Not only has it prevented a just resolution of the Israel-Palestine conflict by enforcing lockstep US support for the most retrograde elements in Israel; in recent years it has, in league with Israeli Prime Minister Benjamin Netanyahu, been doing everything it can to provoke US conflict with Iran. Now, when a conciliatory new government in Tehran is seeking rapprochement with Washington—the best hope for US and regional security in more than three decades—AIPAC and its allies have been pressing Congress for renewed sanctions precisely in order to kill that hope, which could set Washington on the path to war. However, it’s important to recognize that many of the assumptions that underpin AIPAC’s influence don’t carry the force they used to. Praising what he called the “deep connection” between New York and Israel, de Blasio pointed out that New York is “home to the largest Jewish community outside the state of Israel,” as if Jewishness and Zionism (and, by implication, Zionism of the AIPAC sort) were indivisible. But polls consistently show that among Jews, Israel actually ranks very low on the list of political priorities, as do the long-running tensions with Iran. Of far greater concern are the economy, the growing gap between rich and poor, the struggle for social justice—the same issues that animated de Blasio’s mayoral campaign and propelled him to victory. Apart from the question of what Jewish New Yorkers want is that de Blasio is the mayor of, and should speak for, all New Yorkers, including the hundreds of thousands of Muslims and Arabs, not to mention Christians, Buddhists, atheists and others, who live, work, pay taxes and vote in the city. The Nation is the oldest continuously published newspaper in the United States. A storage room unearthed from the ruins of a 1700 B.C. Canaanite palace in northern Israel held the remains of 40 ceramic jars. 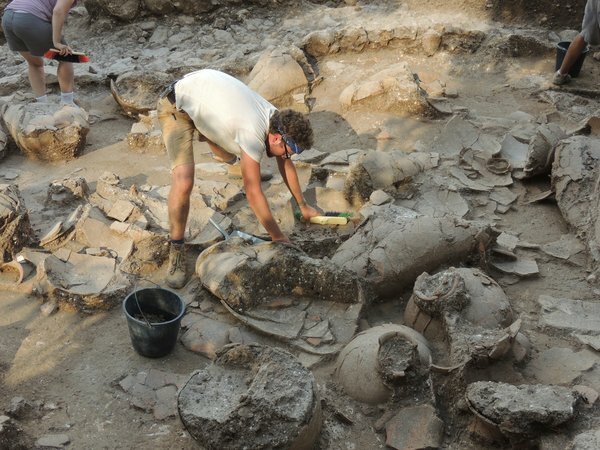 Near the banquet hall where rulers of a Middle Bronze Age city-state and their guests feasted, a team of American and Israeli researchers broke through to a storage room holding the remains of 40 large ceramic jars. The vessels were broken, their liquid contents long since vanished — but not without a trace. A chemical analysis of residues left in the three-foot-tall jars detected organic traces of acids that are common components of all wine, as well as ingredients popular in ancient winemaking. These included honey, mint, cinnamon bark, juniper berries and resins used as a preservative. The recipe was similar to medicinal wines used for 2,000 years in ancient Egypt and probably tasted something like retsina or other resinous Greek wines today. So the archaeologists who have been exploring the Canaanite site, known as Tel Kabri, announced on Friday that they had found one of civilization’s oldest and largest wine cellars. The storage room held the equivalent of about 3,000 bottles of red and white wines, they said — and they suspected that this was not the palace’s only wine cellar. Dr. Cline and the other co-director, Assaf Yasur-Landau of the University of Haifa in Israel, described their findings Friday in Baltimore at the annual meeting of the American Schools of Oriental Research. Another member of the team, Andrew Koh of Brandeis University, reported the results of the organic residue analysis, emphasizing the quantity of the samples and thoroughness of the testing. The researchers had to work fast to examine the residues before they became contaminated on exposure outside the storage room. The archaeologists said that much of the palace, including the banquet hall and the wine storage room, was destroyed 3,600 years ago in some violent event, perhaps an earthquake. The wine cellar was covered with thick debris of mud bricks and plaster. That and the fact that no subsequent buildings were erected on top of the site have made Tel Kabri an inviting place for archaeological studies. Borders change, Israeli officials deny responsibility and confiscate and re-confiscate the property that Ali Ayad hasn’t been allowed to set foot on since 2004. ABU DIS, West Bank — The year Ali Ayad was born, his father broke ground on a majestic home perched on a bluff overlooking Jerusalem, with views of the Dead Sea in one direction and the golden Dome of the Rock in the other. For all of his 59 years, Ayad’s life has revolved around the 1-acre plot. He played under the olive trees as a boy and became manager after the home was converted into the Cliff Hotel. He met his Norwegian wife from behind the reception desk, married her in the dining room and raised two daughters amid the daily bustle of visiting tourists and diplomats. But the idyllic life turned into what he describes as a Kafkaesque nightmare a decade ago after Israel seized control of the hotel. Using a combination of military orders and a controversial absentee-owner law, the government kicked him off the property, banned him from returning and then confiscated it as abandoned. Israel informed Ayad, who has always been identified by Israel as a West Bank resident, that his former home was inside the Jerusalem city limits, even though for decades the municipality refused to provide public services because it said the property was in the West Bank town of Abu Dis.